Tis the season for embracing Christmas crafts, at least for those who embrace DIY as an entertainment choice. It’s easy to let the materials costs spiral out of control, however. Try these affordable and easy solutions for your holiday crafting and gift-giving needs. Instead of spending your extra cash on expensive decorations and then still needing money to throw a big soiree with all of the food trimmings, consider having some friends over for an ornament crafting party. You can make it a holiday happy hour complete with supplies for beaded ornaments, and also share ideas for other homemade tree baubles. If you’re feeling ambitious, you could even set up a few stations for various ornament crafts and let guests try their hand at a few different styles. If you’re the type to host a variety of dinner parties throughout the season and need some elegant winter holiday ideas that won’t break the bank, consider including homemade centerpieces on your list of Christmas crafts. Anything from floral arrangements to greenery garlands with candles is fair game, and depending on the look you are going for, a simple arrangement of glass bulbs can jazz things up affordably as well. One way to streamline your holiday savings is to incorporate more homespun wrapping techniques along with DIY gifts. If decorating your own wrapping paper feels like a bit of a stretch, you may want to start small with some homemade gift tags. Depending on the design you choose, you can even get the kiddos involved to create a fun family memory. These homemade holiday labels from Martha Stewart provide additional information. Whether you are creating them for your tree, fireplace mantle or wind up a staircase banister, holiday garlands are a festive way to decorate. They also provide a great deal of flexibility when it comes to style and choice of materials. Rustic twine with holiday cards clipped on is a fun way to extend your repertoire of Christmas crafts and still have a garland to display. So is wired fabric ribbon in a holiday print that can easily twist and curve around the branches of your tree to provide an instant, low-fuss accessory. Here are some additional Christmas garland ideas to get your creative juices flowing. What’s a winter season without a wreath or two? Their iconic shape and prevalent front door decorative use make these one of my favorite nature crafts for grownups. Whether you are using red twigs, evergreen branches with pine cones or even dried grape vines to create your homemade wreaths, attractive results are easily within your reach. What I love about making gifts in a jar is that you essentially get to enjoy a type of fun Christmas craft project while taking care of some of your gift giving at the same time. This is especially true if you opt for things like bath salts, sugar scrubs or layered beer bread mixes for your jar gifts of choice. These Christmas crafts are all suitably frugal, and designed to help you control costs at an otherwise expensive time of year. 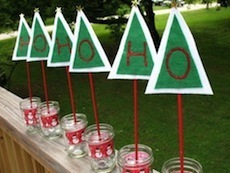 Do you have a favorite homemade holiday craft that your family traditionally enjoys? I love these ideas! Homemade gifts always seem to be the most meaningful. Making crafts and gifts is a great way to avoid overspending and going into additional debt for the holidays.